How has your week been so far? It sure has been very busy at Imagination Crafts HQ, Sue and Harvey are preparing for their shows on the 17 and 18 May. Times for the shows will be posted nearer the time. Yesterday saw the start of our new challenge on our challenge blog. This month the theme is "Things with Wings". Today I am sharing with you all my project. The design team and I are looking forward to seeing your interpretation of our challenge. As you can see I have decorated a candle using the Poppy and Dragonfly stencil with Sparkle Medium Lavender and Candy Floss. The butterflies have been made by filling a Martha Stewart butterfly mould with Amethyst Sparkle Medium, I recommend that you leave this to set for at least 24 to 48 hours. You can see the full range of stencils and sparkle medium on the Imagination Crafts Website. 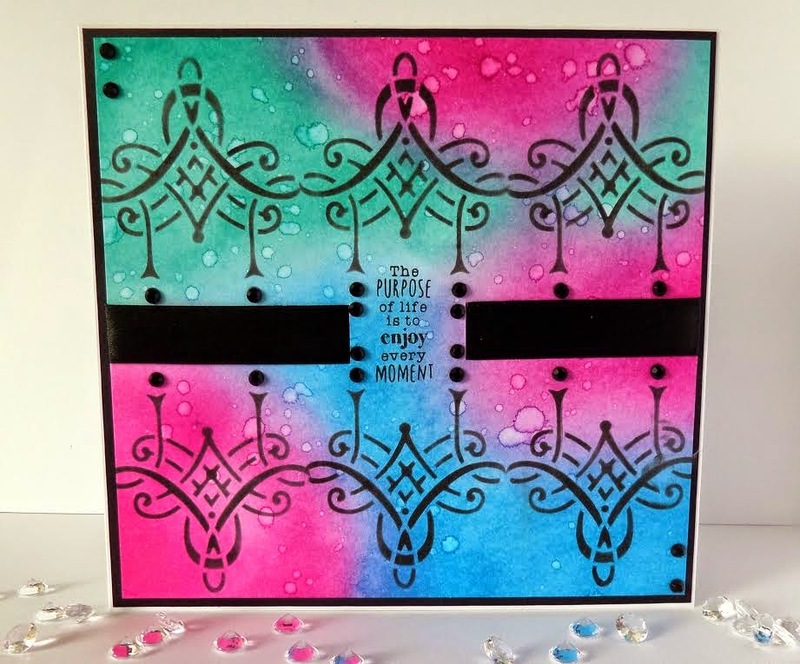 Today we are sharing Cheremane's beautiful card, we love the colours she has used on the background of this card. She has used MacIntosh panel stencil from our website. This is how Cheremane has created this card. Take an 8 x 8 white blank card and matt and layer black card on top. Using a slightly smaller white card and distress ink, Picked Raspberry, Peacock Feathers and Salty Ocean. Give the card a quick dry with a heat gun then flick water onto it and re-dry, this reveals lighters specks. Place your stencil in the middle of your card and use Black Soot distress in and cut and dry foam rub over the cut out sections of the stencil. Repeat the process on either side of the centre first panel. Use a craft knife and make a cut either side of the middle the width of the ribbon and thread the ribbon through then stick to the back of your card, then matt and layer onto the black card. To finish off add a sentiment and decorate with gems. We hope you are all enjoyed your weekend and managing to get some crafting done. Today we have a beautiful box that Jan has decorated using the Toledo Panel Stencil, Red and Gold Sparkle Medium, don't you think this is fabulous? We sure do! We have a range of beautiful Panel Stencils and Card which you can purchase on our website.